Spellbinders Labels 4 is a large die and will create this look for you very easily. 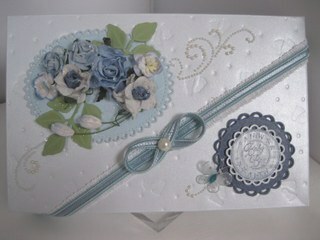 It is a card that can be used for any occasion and how you dress it up can make it truly special. 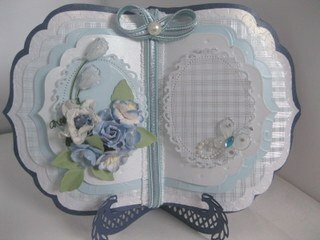 This beautiful Baby card is made into a Book style and created using the Grand Labels 4 set of dies. There are six dies in the set but I have made the pages from the four largest. I have selected four different patterns and shades of blue for each of the four pages ... but you can have as many pages as you wish to your book. It is only the largest of the Grand dies that cannot be used in a smaller die cutting machine such as the Cuttlebug or the Big Shot. But the rest will and will still make you a good sized book. And the Faux Nestie technique is explained in a tutorial ... click the link. I have used the same dark blue to make the box base and the stand to display the finished card. The tutorial is not long enough to bore you but if you decide to give it a try I promise you that you won't be disappointed with the result. 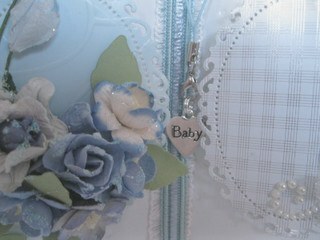 Once the video was completed I decided to add in the Baby charm... just as an extra touch. And it can be removed from the car if need be. But this kind of card is a "Keepsake" and is sure to be treasured for many years to come ... I know I wouldn't want to throw it away. So have fun with your dies and let the Spellbinders Labels 4 create a beautiful card for you.